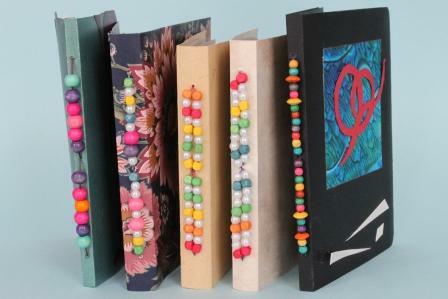 I like coming up with ways of using beads in bookmaking, As a teaching tool, it’s one of those carrots that I can offer students when they are faced with the drudgery of folding many pages perfectly: when the folding is done, their reward is to come pick out their beads. Even if they get to choose, say, only three beads each, it’s still enough to motivate the students to stay on task. 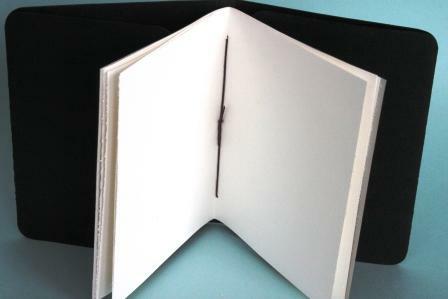 These five books are bound with a simple pamphlet stitch. 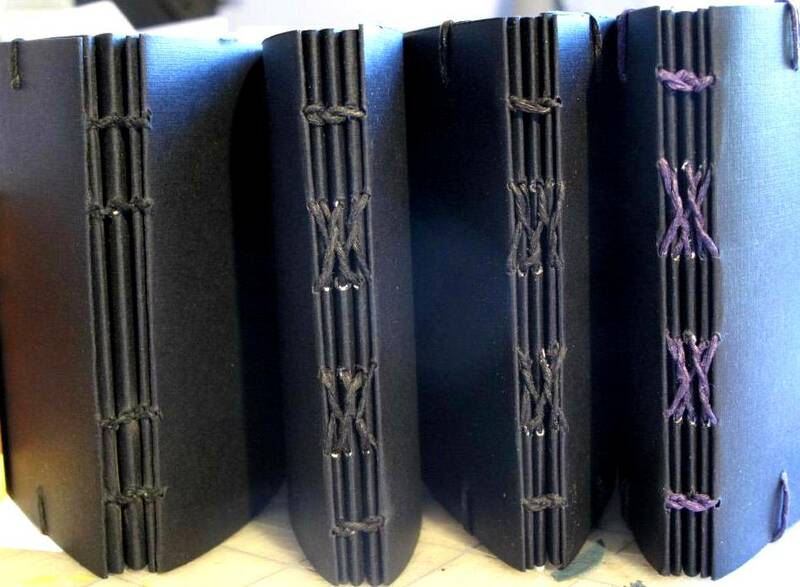 The sewing is done with three holes (stations) going through the spine, one near the top (head), one in the middle and the last one near the bottom (tail). 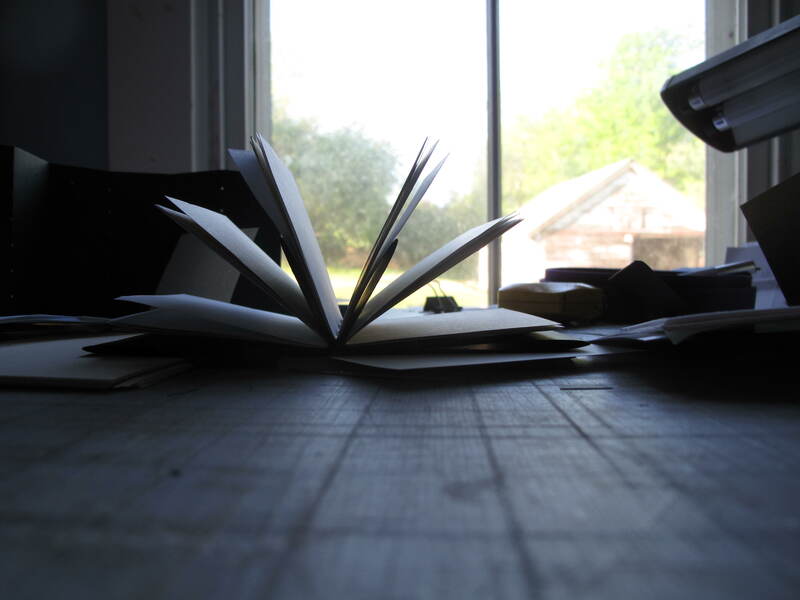 The sewing begins inside the book at the middle station. When the needle emerges from the middle it’s time to add the right amount of beads to fill up the length of thread that takes to get to the top hole. 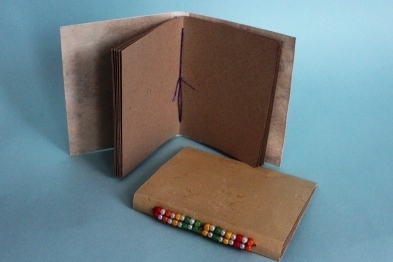 Go through the top hole with the needle and thread then, now on the inside of the book, bring the needle and thread down to the bottom station, go through to the outside of the book, add more beads, go back into the middle of the book, and tie off. 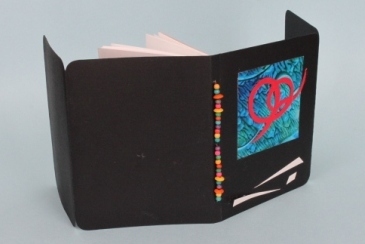 This one is made with heavy paper covers. 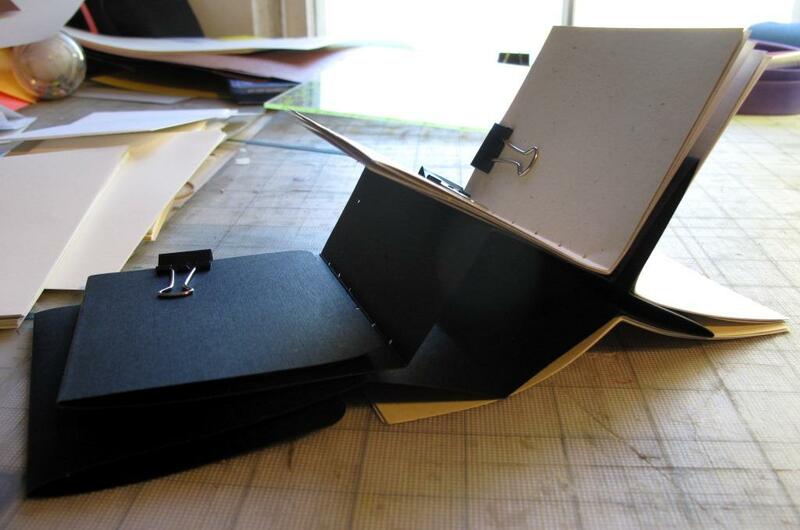 When working with paper covers, I like to double the paper so that the covers feel twice as substantial. 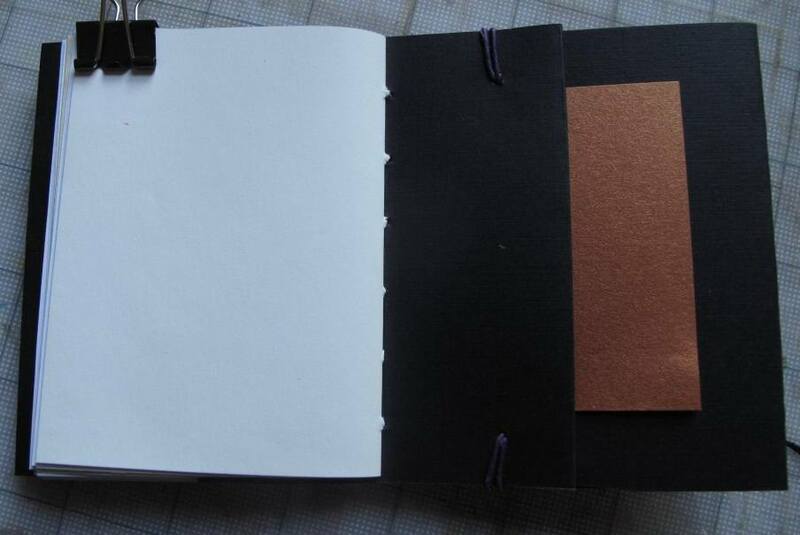 Here’s the inside of the same book, with the covers doubled up. 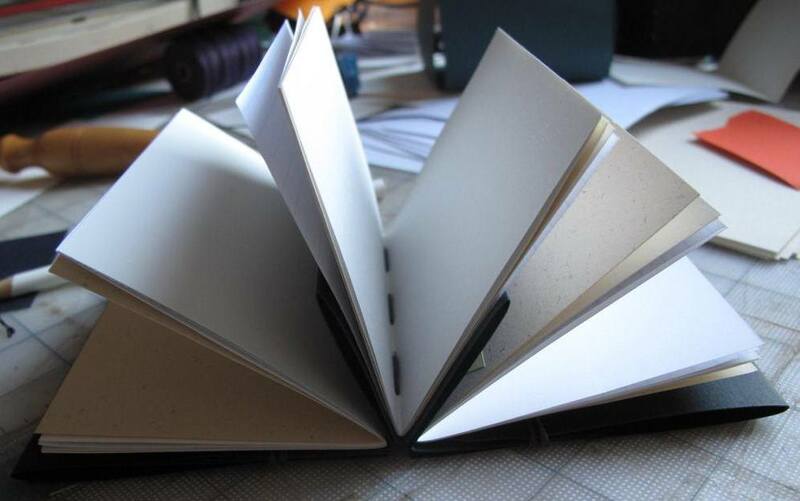 There are eight folded pieces of paper in this book. 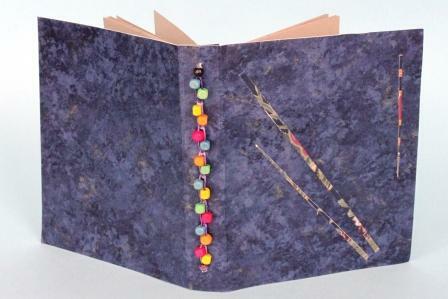 To created the double line of beads I did the pamphlet stitch twice. The first time I reemerge into the middle station I made sure to pass the needle and thread over the long middle stitch before starting the second pamphlet stitch. Now this is the stitch that is bit trickier. It’s an interesting beading pattern done on the chain stitch that Keith Smith describes in his book 1,2,&3 Section Sewings, on page 220. Keith Smith describes the sewing without using beads. 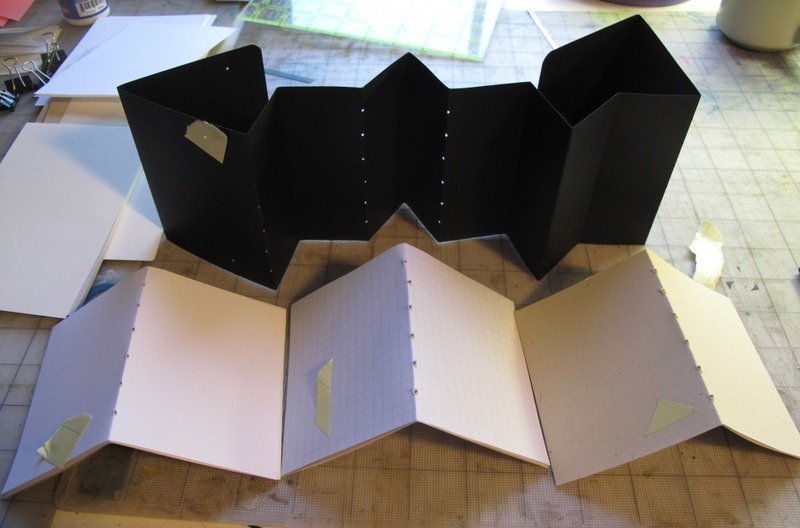 It’s done by first making two sewing stations about 1/8″ apart near the head of the spine, then making sewing stations about a half-inch apart the rest of the way down the spine. 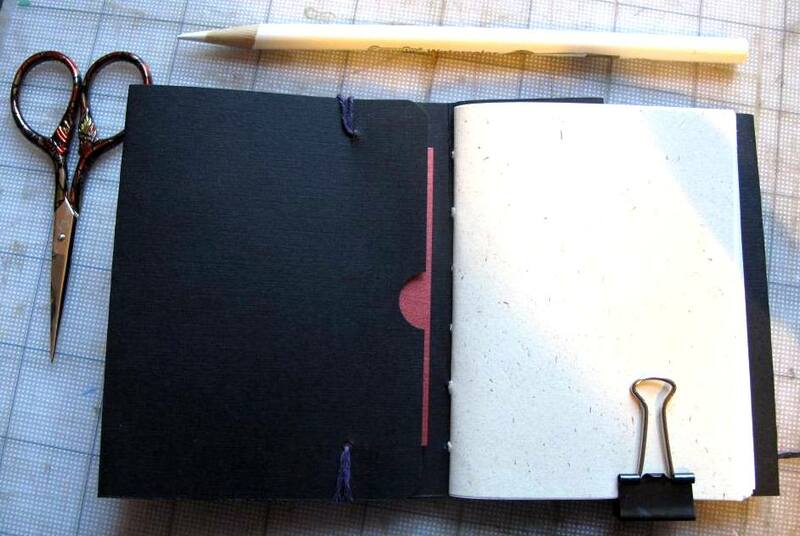 The sewing begins on the inside of the book, going out the first station, then into the second station, then making a knot with the end of the thread . Next, bring the needle and thread out through the third station, bring the needle and thread up to the first stitch on the spine, pass the needle and thread under the this first stitch (on the outside of the book) so that the thread is caught by the stitch, then push the needle and thread back into the third station. The spine now has its first chain. Continue in this matter until there are chains all the way down the spine, then tie off at the last station. The first five spines here are all chain stitches (the second five are all pamphlet stitches). 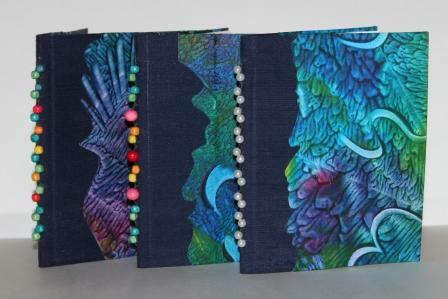 The third, fourth and fifth books from the left are done by adding putting the needle and thread through a bead both when it first comes out of a sewing station, and then again just before it goes back into the same sewing station. The sewing pattern on the first two books in the photo above are still exactly the chain stitch. The difference, the reason that there is that alternating look to the beads is that one bead goes on when the thread emerges from the sewing station, and then a second bead going on just before the needle and thread re-enter the same sewing station. My young friend Rowan figured out this pattern one day when I gave him a book to sew. He wanted to use a bead that was too small to be entered through twice, so, rather than using a different bead, he worked out that he could just use two beads per chain, one in the coming and one in the going. I am wild about this variation! 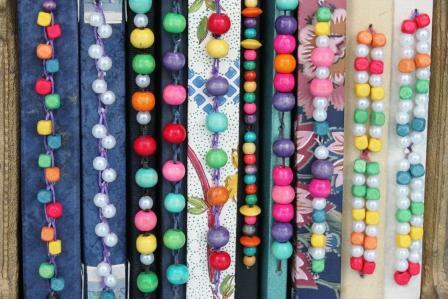 The beads that I use on these books all come from the Dollar Store. The colorful beads are wooden, and the white ones are plastic. 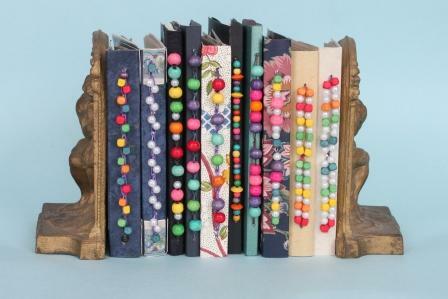 I like using these inexpensive beads because they feel whimsical, and also because I feel reasonably sure that no one will be tempted to take apart the book just to scavenge the beads. For thread, I generally use a two- or four-ply waxed linen thread, but any strong thread or string will work as long as it fits through your needle and your beads.